Located in Irvine, California is Sootha Coffee Shop. Sootha specializes in fair trade, 100% organic coffee. They source their beans from places like Costa Rica, Honduras, Ethiopia, Nicaragua, Papua New Guinea and Guatemala. All of their coffee is roasted in-house and they use the highly-prized La Marzocco espresso machine - which translates into a really great latte! In addition to their great coffee, Sootha serves various tea options such as lattes, slush fruit teas, boba milk teas, hot and iced teas. They also serve fruit smoothies, shaved ices, pastries, salads and sandwiches. Sootha Coffee’s passion for brewing exceptional coffee extends to teaching their customer base; they frequently offer barista classes and coffee tasting events. With a large seating area, including a vast patio with umbrella covered tables, Sootha makes the perfect place for people to work or study for extended periods of time. They even have a closed conference room that can be rented for $10 per hour with reservation and can seat up to ten people. The combination of their top brews and inviting environment, makes them one of the premier coffee shops in the Irvine area. 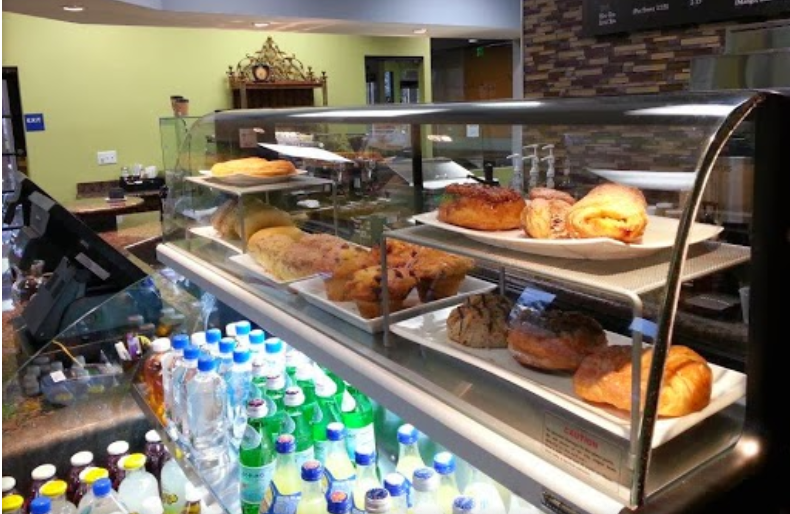 In 2012, Sootha Coffee opened their business in the Northwood Town Center. Months of preparation went into planning for their opening day, including purchasing a POS system. Sootha required an all encompassing POS system that included rewards and loyalty programs. With CCS they were able to get exactly that. CCS offers both “Buy X, Get X Free” programs and points programs. With the points rewards, customers earn a point of every dollar spent. These accounts can be assigned by phone number, email or magnetic stripe card. Every time a customer places their order they can see their points value. It will also be printed on their receipts. These points can be applied as credit to the customer's order when they desire. While CCS office features are included in the POS license, many business owners prefer to have a designated office computer that they can review CCS data on without interrupting their flow of business. This was the case with Sootha. Cafe Cartel supplied Sootha with a back office computer. These are cheaper than an additional POS since they don’t require peripherals such as the receipt printer, cash drawer, etc. From this computer, Sootha can adjust their pricing, inventory and their menu. They can also run reports, reconcile and utilize payroll functions as well. These office licenses can also be added to laptops for owners or managers who work from home or away from the business location. Cafe Cartel has been providing coffee shop POS solutions since 2004. Since then they have had thousands of installations worldwide. As the industry grows, CCS updates it’s software to stay current for all their customer’s POS needs. This makes CCS the best, most reliable solution for coffee shop owners today. To review your coffee shop needs with an industry consultant, call 866-973-8099 or request a quote today. Established in 1872, Argonaut Rowing Club is one of Canada’s largest and oldest clubs located in Toronto, Canada. ARC is located on the Northern Shore of the beautiful Lake Ontario. The Henley Room is part of the Argonaut Rowing Club and is perfect event center for weddings, corporate events and parties. This premier waterfront venue has the capacity to accommodate 200 guests and has been featured on the notable eventsource.ca. In 2014, ARC required a more proficient POS for their bar. They first required a solution that they could use their own hardware with. Secondly, they needed features that accurately calculated special pricing for club members or VIP’s. They contacted Cafe Cartel Systems with a list of the hardware and was able to get a software quote and demo. With CCS they are able to use blind closing, customizable menus, bottle service and dual inventory management. Bartenders can assign names or table names to different checks and split the check in a variety of ways: split by seat, split by group, split by number of checks, or simply by applying payment amounts. Tips are easily inputted and can be applied after the order screen is closed. After the day is closed, all reports are sent via email and can also be accessed periodically during the day throughout the shift. CCS is based in San Diego, California and has provided POS software worldwide, including to Argonaut Rowing Club. CCS for bars includes features such as happy hour pricing, theft control, pre-auth and bartender tracking. Non-industry specific features include employee time clock, payroll, reporting and reconciling. Whether you have your own hardware or would like to compare various styles and price points, Cafe Cartel has the options for you. To review your needs such as features, hardware or integration desired, please call 866-973-8099 or request a quote today. Located just 10 miles northwest of Boston, is McDonough’s Liquor Store. This locally owned and operated company specializes in local craft beers and fine wines. In fact, wine and beer tastings are held every Friday during the week. McDonough’s is the local’s choice for all of their beer, wine and liquor inquiries since they provide insightful drink ideas and food pairing suggestions to their patrons. 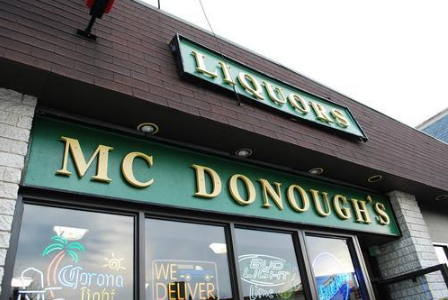 While there are many reason’s why McDonough’s runs a successful liquor store, one in particular is what we will focus this article on: their use of their CCS Point of Sale System. Setup and install of their CCS system was easy and fast. CCS comes with a database of 12000 products and 6000 drink recipes. This saved McDonough’s hours of data entry and recipe research they otherwise would have had to input in their system. The recipe database helps staff be an excellent resource to their patrons and inspires brand loyalty to their establishment. CCS comes with Inventory Lot Management. This means that the POS will be able to show cashiers the product’s location and inventory amount in both the storefront and the warehouse. These figures are updated in real time as the cashiers sell and move product. Upon receiving a purchase order in the system, the item count will be directly added into the warehouse inventory and at that point, it can be moved into the storefront location. Both office and POS computers may also be assigned to pull inventory from different locations by default. This sophisticated inventory tool is not only intuitive, but easy to use for their staff members. CCS has been providing liquor stores across the world with POS software specifically designed for the industry. This intuitive system was designed to do the hard work for you. Cafe Cartel supports item price, case price and split case pricing. They have 4 different pricing levels for both customers and accounts. Systems include item barcoding, label printing, ID verification and security options - everything to give you peace of mind whether you’re a distant or hands-on owner. All CCS systems comes with features such as employee time clock, payroll, labor scheduling, reporting and reconciling. Some POS companies may charge extra for these features, but not Cafe Cartel. If you have any special requests or would like to review your ideal setup with a specialist, call 866-973-8099 to speak with an industry consultant or request a quote today. Located on the edge of Moses Lake is First Class Vapor in Washington state. 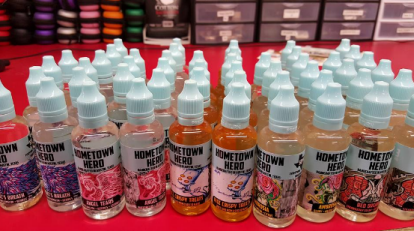 This vape shop stocks of 200+ e-juice flavors and has been a leader of the vape industry in the area since 2014. As a locally owned and operated business they’re passionate about the community and supporting our country's veterans. The combination of this, their helpful staff and comfortable environment, has earned them a loyal customer base and excellent reputation. 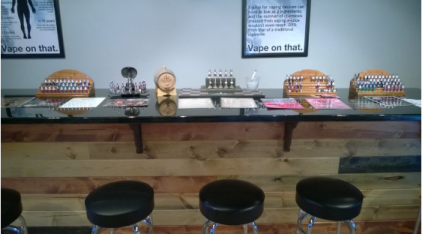 Upon opening in 2014, First Class Vapor had a hard time finding a Point of Sale company that could handle a vape menu layout and inventory in an effective way. They called Cafe Cartel to review their needs with an industry consultant. They liked what they found. With CCS, they’re able to keep track of their mods, accessories, batteries and all of their combinations and colors. These items don’t come with barcodes and there is no need for them to be barcoded since CCS has a much simpler solution with minimal data entry. For example, when selecting various mods, instead of having a lot of buttons for each item by color, they can select the color button from the side before selecting the item to designate it. This can be done for mods as well by selecting the color button, and then the mod. The same can be applied to cartos by selecting the size button and then the brand item. This minimizes the amount of buttons on the layout and keeps the menu layout optimally organized in a way that standard retail POS systems cannot accommodate. Additionally, First Class Vapor appreciated Cafe Cartel’s easy-to-use vape inventory system. To update the store with new inventory, FCV first creates a purchase order in the system. This process is as simple as ringing up a customer, though instead of selecting new order, they select purchase order. Users then add the amount of products coming into the store. Once completed, CCS will automatically update inventory counts within the system. The current inventory count of the products will be displayed on the order buttons for cashiers to see. This will be updated in real time as sales continue throughout the day. Sales reports, inventory counts and profit margins analysis can be periodically pulled throughout the day. At the end of each day, when the cashier closes the shift, reports will automatically be emailed to the address designated by the owner. Special permissions in the system can be designated to only managers or supervisors to prevent employee tampering or unauthorized interference. In addition to industry specific features, CCS includes employee time clock, payroll functions, reconciling and much more. With a variety of hardware solutions at every price point, CCS can meet any vape shop’s needs. Their top quality support will ensure your system will run for years to come and always be up-to-date with the latest software trends. To review your needs with a vape consultant, call 866-973-8099 or request a quote today. Get Your Vape On is a premier vape shop that has over 200 juices, batteries, mods and e-cigarette starter kits designed for every budget. They also offer RBA’s, custom batteries/tubes and 100% organic e-juices. Located in San Antonio Texas, GYVO is a leader in the local vaping community. Their knowledgeable staff provides insightful and personalized suggestions. They even have signs around the store that have facts about the properties of vaping. While GYVO opened mid 2014, they began their search for a Point of Sale System at the beginning of the year. Since POS systems handles everything from employee management to inventory, and from business analytics to transactions, they turned to the leading POS provider in the vaping industry: Cafe Cartel Systems. CCS has designed their sales and inventory functions specifically for vape operations. And while every industry has its needs, every business has their own priorities. Let’s take a look at some of Get Your Vape On’s top desires. 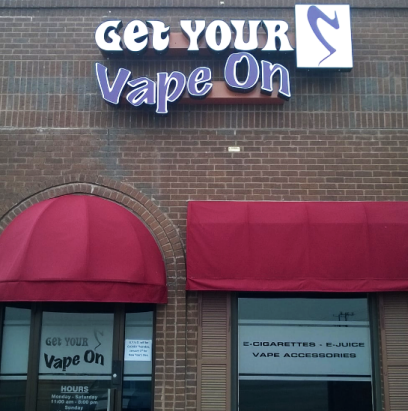 Get Your Vape On keeps their customers engaged by offering routine sales on various products. These sales will be on assorted products for certain period of time. They also do flash sales that are similar to a happy hour special. Cafe Cartel not only has features to do these types of functions specifically, but they also offer “Buy X, Get X Free” programs and rewards/loyalty points programs. Points programs can be assigned to a phone number, name or email address. Every dollar spent will accumulate one point on the customer’s account. Points will be visible on the display and will be printed on receipts. Customers can accumulate points until they wish to apply them to an order for store credit. These types of programs insure repeat business and shop loyalty - hence the name. Point of Sale Systems come in all sorts of styles and sizes. CCS provides different styles, at every price point. For Get Your Vape On, it was their priority that they have tablets. Thus, CCS provided them with a stylish and durable setup, the Altera 3600 Tablet. Included was barcode scanners, QuickBooks integration and Back Office Software. The Back Office Software allows managers to do payroll, update inventory and specials without interfering with the cashiers at the front of house. These licenses can be placed on laptops for owners/manager who work offsite. Additionally, CCS also offers website integration options for Vape Shops who also do business online. Integrated credit card processing is also included. CCS partners with the top merchant processors to date.These partnerships make sure merchants have the support they need and processing options they want. These include EMV/chip card reading, debit and NFC, such as accepting ApplePay or Paypal payments. Cafe Cartel has a team of support specialists to ensure both hardware and software is functioning optimally and will have a long lifespan. This top level support aids staff who run into technical difficulties, damaged hardware or general questions they may need assistance with. CCS has met the unique needs of thousands of vape shops around the world. We understand that each business has their own priorities, just like Get Your Vape On. To review your needs with an industry consultant, call 866-973-8099 or request a quote today. We have a team of trained professionals ready assist you. Located in Rhode Island is City Vapor & E-Cig; a veteran and locally owned company.